This area was built in the 18th century, and it's Barcelona's most lively district, filled with small bars, restaurants and wineries - perfect for an authentic taste of Barcelona ;) It is surrounded by the Port Olímpic, the B-10 motorway and the sea, so on the seafront, you just can’t move for all the beaches… there’s the Barceloneta, the Somorrostro, the Sant Sebastià and the Sant Miguel! This area is criss-crossed by little pretty alleys. And they’ll lead you to ancient buildings, beautiful churches, and delightful squares - so it’s just like going back 200 years! The area is still very much true to its traditions, even if the part closest to the sea is somewhat modern. You’ll be able to see the fishing boats come in to harbour then experience the fish market just after - it's rumoured to be the best place to try the fish too! Enjoy the natural and typically Catalan charm of this area, and be sure not to miss the Museo d’Història de Catalunya (Museum of Catalan History) or the Torre del Reloj, plus it's just a stone's throw away from the Barcelona Aquarium. But as with all good things, there comes a downside - and in Barceloneta it’s a nightmare to find somewhere to park! But, that’s where we come in, just go onto the map and find a car park, which suits your needs and budget, then book it! So your parking space is sorted before you arrive, for a great price too! 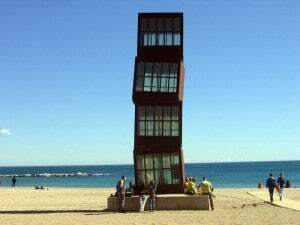 If you need to park in La Barceloneta area of Barcelona, then Parclick is your best call! The beach is the oldest and most famous in Barcelona, so with it’s great location and high scale atmosphere, it’s not easy to find parking! If you’re planning on coming here then the best option is to book your parking before in one of our car parks in Barceloneta!